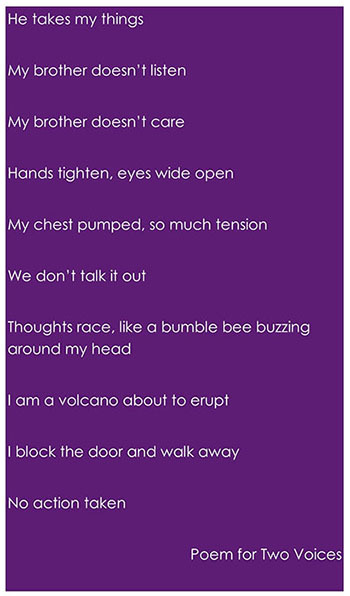 “Just like fire that lit a fuse to a stick of dynamite, I felt fire in my lungs.” These are the beginning lines from a poem written by a police officer and a middle school student working together at Eastlake Middle School in Eastlake, Ohio. 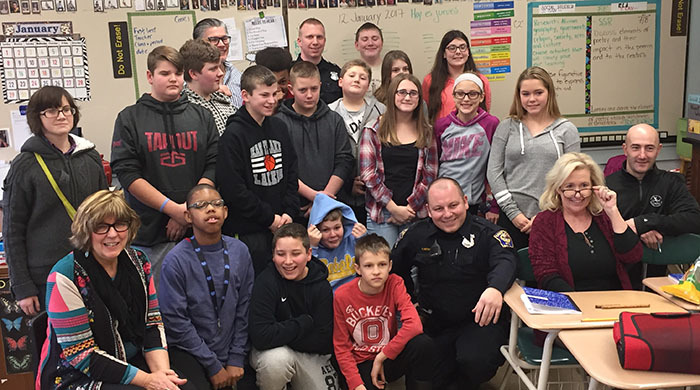 In 2016, the Willoughby-Eastlake Public Library partnered with the Eastlake Police Department and Outspoken Literacy Consultants in a project called “If These Streets Could Talk,” which connected police officers and middle school students through poetry. The project was made possible through a Library Services Technology Act (LSTA) grant awarded to Willoughby-Eastlake Public Library from the State Library of Ohio. The idea for the project began at a water aerobics class where Lori Caszatt, the Communications and Development Manager at Willoughby-Eastlake Public Library, and Sara Holbrook, a poet and co-founder of Outspoken Literacy Consultants, first met. Holbrook had read about poets working with doctors to find solutions for stress, leading her to consider the impact poetry might have on police officers. “I asked myself, what are we doing to support these police officers?” said Holbrook. As soon as Holbrook pitched the idea of creating poetry with police officers and students, Caszatt was hooked. She began her research on how to obtain grant funding for the project. During the time Caszatt applied for the grant, there was a large amount of news coverage due to police shootings across the country. “There was a lot of distrust towards our police officers,” Caszatt said. “Tamir Rice lived in our community. This was a big news story at the time we decided to apply for the grant.” For Caszatt and Holbrook, this project was all about rebuilding trust and building better relationships between kids and police officers. Initially, Eastlake Police Chief Larry Reik was hesitant when Caszatt first approached him about participating in the project. There were concerns about keeping the police officers anonymous, as well as the fear of potential public backlash. Salinger and Holbrook helped persuade the police officers to participate, explaining that the workshop extended beyond “writing about one’s feelings.” The program would also help the police officers develop their own writing skills and improve their written reports and descriptions. When the police officers first walked into the classroom, they recognized many of the kids from previous encounters. Most of the participating kids were considered at-risk, and were either from low income families or had disabilities. For many of the children, coming into contact with the police often meant they, or a family member, were in trouble. While both parties were hesitant at first, the children and police officers began to grow more comfortable with one another as the workshop progressed. “We found a parallel between middle school kids and police officers in that they don’t like to show their feelings,” Salinger said. By taking the two groups out of their comfort zones, the workshop became an equalizer. “They met on equal footing,” Salinger explained. In this workshop, the two groups came together as collaborators. Both the students and police officers had the same poetry writing experience. 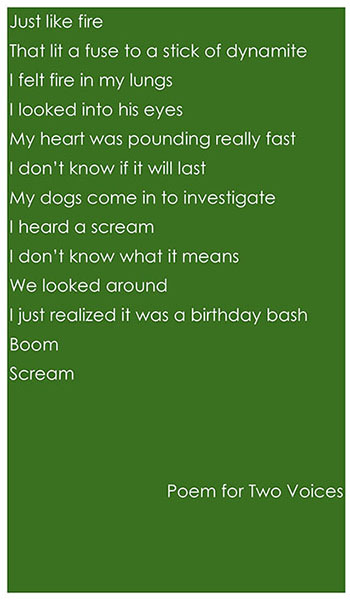 The Literacy Consultants used the same writing prompts and exercises with both, so that they would be equally prepared when brought together. By approaching the workshop at the same writing level, the police officers and students were more comfortable working together. While the police officers had more sophisticated vocabulary, they had no more experience writing poetry than the students. On February 14, community members gathered at Eastlake City Hall to hear the police officers and middle school students read their poetry aloud. 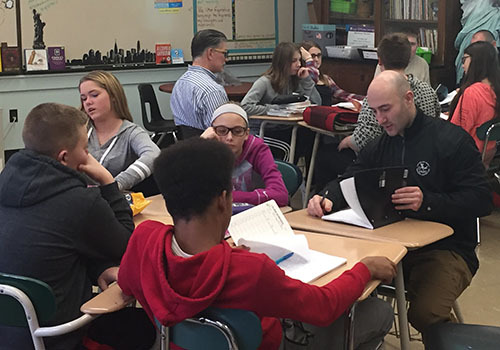 “To hear the kids read the poetry and hear the poems they wrote together was really cool,” Caszatt said. It was also rewarding to see the changes in kids’ confidence. One of Caszatt’s favorite memories—and one that she will never forget—is watching an autistic child read aloud for the first time, in front of 50 community members at City Hall. One of the central themes in the project was the library’s essential role in the community. “The library is a community anchor,” Caszatt said. Libraries are one of the few remaining public places that serve people across all age ranges. Because of their unique range in audiences, libraries play a critical role in community building, especially through local partnerships. As a community gathering place, libraries must leverage their ability to partner with local organizations, whether it’s with a business, local nonprofit, police or fire department. Looking forward, Caszatt and the Literacy Consultants hope to see a similar project implemented in the future. “I think we built a great model where, with a little training, we could train poets to do this in other locations,” Holbrook said. By having a common framework, and building from a step-by-step process, teachers and other professionals will be able to lead their own workshops. Both emphasized the importance in creating strong relationships between police officers and students as early as possible to build trust.